Latitud 34° is a family produced easy drinking wine range from Mendoza. The family have been making wines for 3 generations in Mendoza. The grapes are hand harvested from their vineyards on the 34th latitude, at altitude in the mountain vineyards of Mendoza. They are then sorted by hand again to ensure only the fully ripe, clean grapes go into the wines. They are then fermented in a state-of-the-art winery, also in Mendoza, allowing the wine maker to control the temperatures and keep the freshness of the wines.Enrique Carrelli (the father and winemaker) is very proud of the Latitud 34° range as they are wines that really show the full potential of young high quality wines from Mendoza at a reasonable price. However, his passion for Malbec has seen the range of wines he produces extended so that he can make reserve malbec wines too. These are aged in French oak barrels and the resulting wines are highly sought after and well awarded. Enrique’s son, also called Enrique, is now working alongside his father ensuring the wineries future. 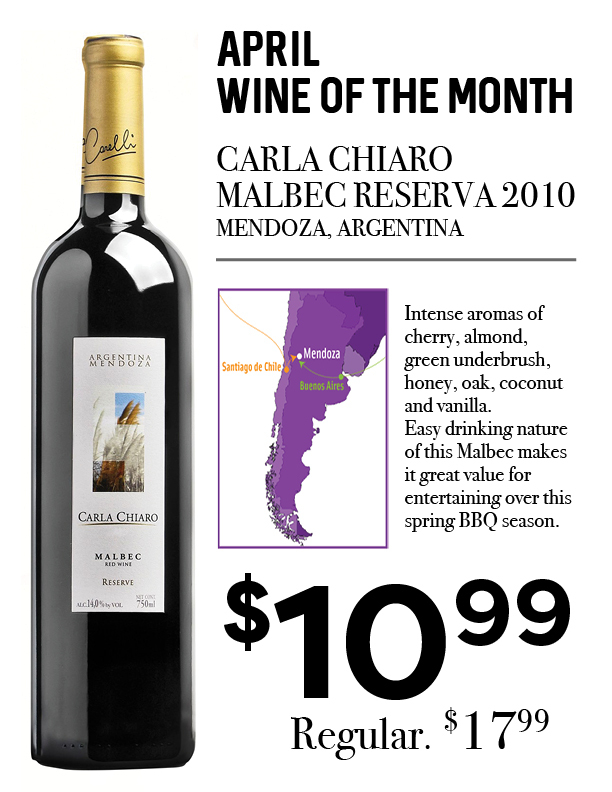 Rich full-bodied Malbec with impressive notes of black fruits – blackcurrant, black cassis, blackberry, and black cherry. Soft and mellow tannins are structured by a great acidity to pair this wine wonderfully with BBQ dishes – BBQ ribs, beef brisket, pulled pork or chicken. This red is an ultimate spring red you can enjoy a glass everyday or for any special dinner on weekend!